There are well over 2,000 known species of mantis in order Mantodea. Almost all the ones you're likely to encounter are from family Mantidae and genus Mantis. 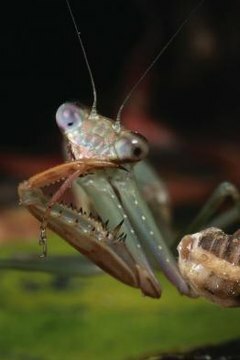 Care for all is similar, but always double-check feeding, humidity, temperature and substrate information for your particular species before setting up a cage -- especially if you purchased an exotic mantis from a pet supplier. Clean the container thoroughly with plain water and a clean, new, soap-free sponge. Allow it to completely dry in the sun. Size depends on your mantis' adult height; your cage must be at least three times as wide as your pet is tall, and at least three times her height. Larger is fine, but not so large her food can get lost forever. Smaller will kill your mantis -- she'll be unable to properly move, stretch out and dry as she molts. Large, repurposed glass containers such as fruit jars are acceptable for some species as long as they're well ventilated. Fit a cover to the container. A terrarium with a sliding, locking mesh lid needs no additional work. A plastic container can use different approaches. You can punch holes no larger than 1/8-inch in diameter all the way around the container and lid, or fit a piece of hardware cloth over the top, cut it to shape and press the edges down to form a secure cover; or fit a piece of screen or cheesecloth over the container's mouth and secure it with a rubber band. Ventilation is the main issue, so if you're using the hole-punching method, make sure the number of holes provides open space equivalent to a mesh screen. Fill the bottom with 3 to 4 inches of potting soil or shredded substrate, or line it with newspaper. Use soil without fertilizer or pesticides. Shredded bark or coconut fiber is for cages without live plants. Newspaper is sanitary, cheap and easy to clean, but doesn't hold moisture well. Add plants or branches. Your pet needs plenty of vertical surfaces to climb and hang onto, but not so many they prevent normal movement, especially grabbing food. Root plants in soil substrate. Purchase branches from a pet supplier, or sterilize by steam cleaning or boiling for several minutes. Anchor all branches firmly so your pet can't accidentally knock them over and crush herself. Mist the cage once daily to provide drinking water. Only use new spray bottles that have never held anything else. Mantids need humidity, more so when they're shedding, but misting shouldn't leave them soaking wet. Don't use water dishes or sponges -- they encourage drowning and microbial growth.  Most adult mantids eat two to three times a week. Gutload commercial insects at least three days on nutritious food. ⚠ Don't house more than one mantis per cage. Never leave live insects in the cage. Non-native species may need specific temperatures.